In this document i describe how cc-lines are done and work in Grand Prix 2. Cc-line is what is called ideal line or best line in gp2 and/or real life. With cc we refer to the computer control or computer controlled cars. CC-line editing becomes a special meaning because of mainly two reasons. At first, a cc-line is neccessary to the game. At second you still have to do it by hand. At first we have to understand how the cc-line is related to the rest of the track. Mainly the cc-line is a geometrical object on its own. It is defined by its own table of sectors. It is connected to the track at just one point, the beginning of track sector 0. 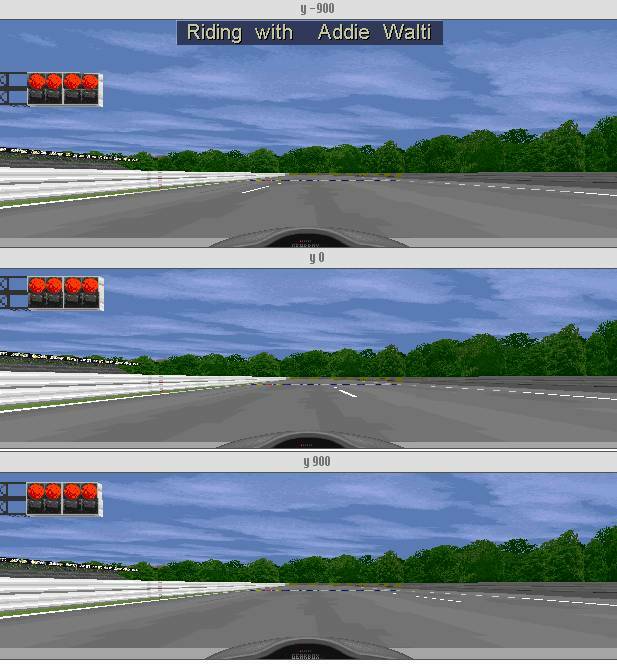 Then the exact beginning of the cc-line is defined by the values of the cc-start arguments in the header of the track. In the TE (trackeditor of Paul Hoad) this header can be found in the track config section in the track tree. Unfortunately there is no tool available for generating cc-lines so far. There were attempts to build cc-line wizards in the past, but you probably will find out that they do not give you a usable result in every case. So there is no way around making it by hand as soon as your track has more than one corner. And you also may notice sooner than expected that the cc-line does not even show up in an acurate way in the TE (please have a look at the original tracks, e.g. Adelaide f1ct16.dat, to get an idea here). Its one of the remaining mysteries of gp2 track editing, why the cc-line shows up the way it shows up in the TE. So you will have to make the line sector by sector and checking every step in the game. You need a reliable "environment" where you can switch and switch back as easy and fast as it gets between trackeditor and game. This document covers the basics of cc-line editing. I do not really discuss “how to make A GOOD cc-line”. The discussion about that would be never-ending, so i suggest to not start it at all :) I just say, the cc-line should "feel good" to keyboard drivers and the cc-cars should behave as reasonable as it gets, and their strength should be about the same as in the original tracks (but here you also can deal with their setup). I describe how I do it. If you follow this guide i guess you will get acceptable results soon. Later you probably will develope your own approach to the job (and i will be glad to learn your approaches and possibly include them here). A few important notes at first: So here is the cc-line rule number one: do start with cc-line-developping only when the track-layout is definitely finished. Also the pitlane has to be fixed first, because sometimes there are changes to the track-layout necessary also when working on the pitlane. As soon as you change a little thing of the track layout you risk to completely mess up the cc-line. Rule number two is of course: frequently backups (copies) of the track in a save place (e.g. after every finished corner; believe me i know what i am talking about here :). When refering to a trackeditor (TE), i mean version 1.7.3 of Paul Hoad. Unfortunately the ccStart-arguments are not easy to understand. I see them as definition for the very first cc-line-sector, which leads into cc-line sector 0, c0. They are not what they are labeled. The line seems to start always at an offset of about 4 into t0. The arguments in the TE labeled with ccStartX and ccStartXHigh are unks actually. As far as i saw, they do somehow influence the angle of the cc-line at the very beginning (see below). ccStartX=0 hangs the game when loading the track. Then we have 4 unks. The first two are not clear to me. Unk3 and unk4 describe the angle of the cc-line at the very beginning IF startX is set to 1 and startX (high) is set to 208. Unk3 and unk4 describe the angle in a way similar to the radius value of the curved cc-line sectors. unk3 is the sign, unk4 the radius. If you dont know yet how radii work in cc-line sectors, you may want to check this out first. Unk3=0 and unk4=1100 is sharp to the right, then the "wider the radius" the closer the starting angle comes to straight ahead. Unk3=-1 and unk4=65535 is sharp to the left, then the "wider the radius" the closer the starting angle comes to straight. But as i mentioned before, these angles at the very beginning seem to work only with startX =1 and startX(high) = 208. Other values seem to simply straighten the cc-line or make the angle much tighter. Most of the times you may want to simply let be the original values and just adjust the startY-value for a good approach of the first corner after the s/f-line. Basically its the same as defining the track itsself, but without the heights. You have SECTORS of the cc-line and every sector has a LENGTH and a RADIUS. Length is about the same unit as in track-sectors. We have two kind of cc-line sectors, the so called cmd80-sectors and the cmd112-sectors. The cmd80-sectors are straight or curved with constant radius. The cmd112-sectors ar curved with transition radius (like arc of ellipse). The following image shows the cc-line editbox. It opens when you doubleclick an entry in the cc-line data table in the track tree. Here we see the box with a cmd 112 sector. Length is not hard to understand. As its name implies its the length of the sector. The unit seems to be the same as with track sectors. Radius is a bit tricky at the beginning. Lets leave alone the “alternative input fields” in the TE. 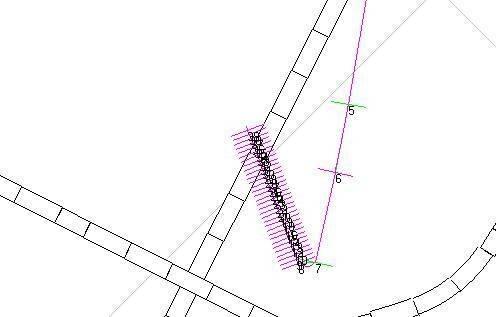 Then you have two fields RADIUS and SIGN/SCALE. Set both values to 0 to get a straight. Set sign to 0 or greater than zero and radius greater than 0 to get a turn to the right. Set sign to a negative value and radius to a value 1..65535 to get a turn to the left. Radius unit is very small. You may want to increase, decrease radius-values by steps of 10000 at first, then maybe by steps of 1000 or 500 for fine-tuning. The tightest possible turn to the right is radius=1 and sign=0. The bigger the radius-value, the wider the corner. If you reach a radius-value of 65535 and still want to increase (you will often want to), then the next will be: increase sign to 1 and start over with the radius=1 (or 0), increasing. So far so good. Now for the tricky part: the tightest turn to the left is radius=65535 and sign=-1. The SMALLER the radius-value, the wider the corner. If you reach a radius-value of 0 and still want to decrease (you will often want to), then the next will be: decrease sign to -2 and start over with the radius=65535, decreasing. The remaining three fields are described later in this text. "tighter/wider". "0x70 unk". Then you go into the game and have a look. maybe you have to increase or decrease the length of the very first sector. Pretty sure you have to adapt the radius of the second cc-line sector. if the corner is right, you go on to the next section, etc. "Rather than putting a sharp corner at the end of a cc-line which is in development, I find it easier to start a new cc-line by deleting all of the original. I then just add sections as I need them. It's easy to see where the cc-line ends because it suddenly 'snaps' to the middle of the track (i.e. the default cc-line). I usually add enough 4 cc sections at a time - enough to get to the next corner and around it." Thats it. the hard part is, you have to switch between the game and the TE after every change, to verify it ... and the more corners there are, the more time consuming it is (but thats no surprise to anybody i guess :). Actually chicanes or even double chicanes are the worst thing to do (i once fighted more than 4hours with such a double chicane. But that was before i knew about the tighter/wider value). For adjusting the speed of the cc-cars, i prefer appropriate setting of the rear wing in the cc-car setup. I guess for most of the tracks this works perfectly. If the cc-cars are too fast, increase it. If they are too slow, decrease it. I prefer to adjust their speed in order to have them about as hard to beat as in the original-tracks. This is a bit tricky in the TE. I do it this way, maybe there is an easier way. Here we go: i choose the cc-line tool in the toolbox-floater. I select the cc-line sector whereafter I want to insert the new one. I select by clicking on the appropriate line in the cc-line table window. (Clicking in the track-tree does not do it). Or you click at the sector in the track-view window. But i dont like that method very much, because you never know what else get changed, if you click in this window. Clicking into this window is free of stress only if the zoom- or the point tool is selected. If the sector is selected (blue colored), I choose "insert new cc-line sector" in the cc-line menu. I assume that track view window ("Track / Track View" or "Table / Track View") is open and tools toolbar ("View / Tools Toolbar") is showing up. - to select a cc-line sector, point and click at its beginning. If you got it, the sector turns blue bold like in the following image. - now choose "CC Line / Insert CC Section" for inserting a cmd80 cc-sector or "CC Line / Insert CC Section (cmd 0x70)" for inserting a cmd112 cc-sector AFTER the selected cc-line sector. - when inserting a cmd112 cc-sector you have to press the F5-key afterwards to SEE what happend. To delete a cc-line sector do select it like mentioned above and choose "CC Line / Remove CC Section". there is no need to press F5 here to get a track view refresh. At the end of the lap you may have noticed the cc-line is disappearing. No worry, it is not disappearing, it is just somehow covered by the starting grid. All you have to do is shifting it away (e.g. all offsets +100). Be sure to let match begin and end of the cc-line as perfect as it gets. Quick race; watch them when they cross the attachement-point of begin and end of cc-line. It should be completely smooth. Its probably not news but i made my tests with the cmd112 cc-line sectors and came to the conclusion, that the two 0x70-only-unks really are the 2nd radius, as Timmo mentioned in the forum in August last year. The regular radius arguments describe the radius at the beginning of the sector. The radius as given by the two unks describe the radius AT THE END of the sector (the upper field is sign and the lower field is radius). The line between beginning and end of sector has a transition radius, similar to a sector of an ellipse. If watching the originaltracks and imagine the parabolas at the appropriate sectors, it becomes obvious. A very good example is f1ct16.dat, Adelaide. Another ‘proove’ of this is to set the regular radius in a cmd112 cc-line sector to 0 (straight) and also set the two unks to zero: you guessed it, it becomes a straight sector. I checked that. Last but not least: to transform a cmd112-sector to a regular cmd80 sector, just copy the values of the regular radius to the two unks. Theoretically. Practically, it doesnt work. The second radius seems to have to be bigger about 1000 than the regular radius (smaller 1000 if turning to the left), else the cc-line get messed up. Thats what i found in the few tests i did here. Hm, later, by chance i came to the opinion it works also ! So it seems to work under certain circumstances and it seems to not work under other circustances ?! To see lots of cmd112-cc-line sectors of any kind, please have a look at the "Grauholz 99"-track, to be found in the "fictional tracks"-section at grandprix2.com. Mal Ross reported a case where the cc-cars ACCELERATED at a decreasing radius. The "rules" for setting sign and radius are the same as for the regular radius, although sign is represented by its unsigned figure sometimes. Remember: 65535 equals -1 here ! As you may know, the length unit of a cc-line sector seems to be the same as with the track-sector, 16 feet, 4.87m. Some of you may have had problems with this big grid when trying to develope a reasonable cc-line. So did i. I always wondered why we have to deal with such a large unit here. The answer ? We dont have to, actually ! We can be as precise as we wish, because we have the ‘tighter/wider’ - argument in the cc-line! It works also with cmd112-sectors. And, these two ideas also partly explain some strange things in the TE when showing the cc-line in the track-view. The first idea becomes especially obvious in original-Adelaide. The 2nd idea is much more subtle. the track. Of course, this may only be possible for fantasy tracks where the width does not have to be 'realistic'. However, you don't have to change the width on both sides of the track - just the outside." 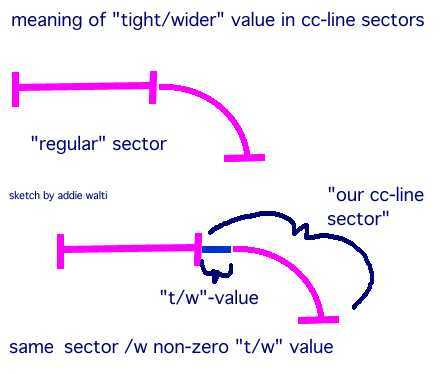 There is one important limit to cc-lines: the maximum number of curved cc-line-sectors. And here you have to add also the curved pit lane sectors. (The pit lane sectors seem to have kind of built-in cc-line sectors.) This maximum number seems to be around 74, as snqqpy.dog found when working on the ultima track. If you go beyond this number the track will freeze the game when loading it.